Spanish architecture studio Recetas Urbanas (Urban Recipes) will be leaping to this year’s Art Basel, courtesy of New York-based arts organizer Creative Time. In the group’s first international commission, Creative Time has organized Basilea, a series of interactive projects for Basel, Switzerland locals and international fairgoers alike. Basilea will sit on Basel’s Messeplatz and involve visitors through a combination of talks, hands-on workshops, observations, and even through soliciting their help to build the pavilions. By involving the public, Basilea aims to empower guests to re-examine their role as citizens and the effect they can have in civic systems. In the three weeks leading up to Art Basel’s opening on May 23, Recetas Urbanas, headed by architect Santiago Cirugeda, will construct a public pavilion with help from volunteers. The “multi-purpose civic structure,” which will resemble an auditorium, will be built from locally-sourced and found materials, while the participants (fairgoers can sign up here) will be encouraged to learn from each other in a mutual sharing of ideas. After a run of performances and as-of-yet undetermined talks, the future home of the venue will be handed over to the public to vote on. 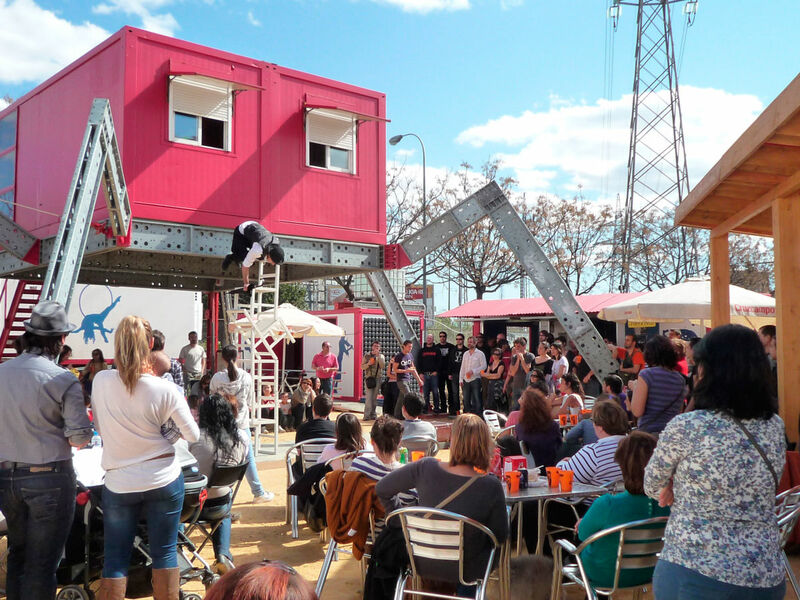 Recetas Urbanas is well known in Spain for their low-cost “guerilla” structures, and previously represented Spain at the 2016 Venice Architecture Biennale. Spanish artist Lara Almarcegui, who represented Spain at the 2013 Venice Biennale, will construct a large-scale “quarry” installation made of gravel that will surround the finished Recetas Urbanas pavilion. The piece will grow daily over the course of the fair, as gravel mirroring the amount removed from a local Basel quarry will be deposited on the Messeplatz, and ask viewers to consider the destructive impact humans have on the environment. Dominican-American artist Isabel Lewis will round out Creative Time’s program, and using her training in dance and philosophy, and experience staging interactive shows, will host a series of workshops and events. Throughout the fair, Lewis will encourage visitors to rethink how they conceive of “self” versus “community”, and how citizens form relationships with the urban space around them. Basilea marks the first time the trio of artists will collaborate with each other, and their program at Art Basel should layer and complement each other’s work. Art Basel 2018 will run from May 23 through June 17.